Baga Beach: Goa is surrounded by beautiful beaches and Baga Beach is the best among all of the beaches in Goa. Baga beach is known for water sports, fishing and Dolphin watching and is one of best tourist spots in Goa. Calangute Beach: Calangute beach is the largest among all of the beaches in Goa. The scenic view of the Calangute beach is awesome where tourists can experience the adventures too. 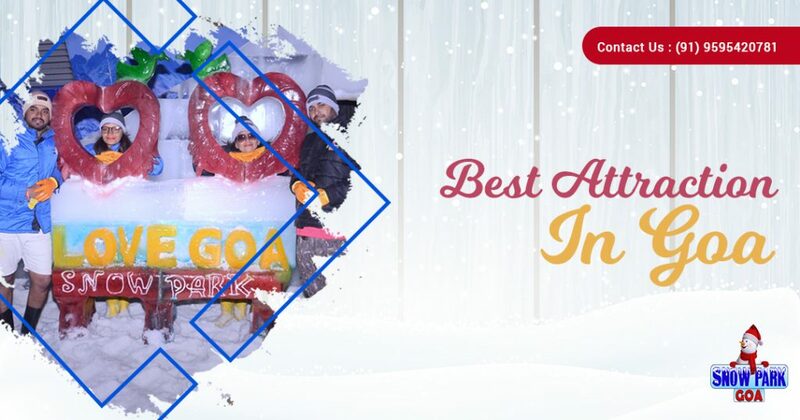 Snow Park Goa: The Snow Park is the only Snow theme park in Goa and is among the best attractions in Goa where you will have a memorable time playing with the real snow, ice sliding, dancing on snow, snow sledging, having the drinks in ice glasses etc. Dudhsagar Waterfalls: Dudhsagar waterfalls are located on the border of Goa and the Karnataka and this waterfall is listed among the tallest waterfalls in India having height 370 meters or 1017 feet. Palolem Beach: If you are looking for a peaceful time then Palolem beach which is known for its calm waters and nightlife is totally recommended. This beach includes yoga classes, silent discos, dolphin-watching, and ayurvedic massages. Anjuna Beach: Situated on the Northern part of Goa, which is surrounded by the hills. A visit to Anjuna Beach will leave you rejuvenated. Club Cubana: This club has a large outdoor area with a pool. Known as one of Asia’s largest and the most happening night clubs in Goa. They have several performances and theme parties, every Wednesday’s are ladies night wherein the entry is completely free and they are served free drinks. Aguada Fort: This ancient Portuguese fort and its lighthouse hold a lot of historic importance. It is located on the Sinquerim Beach overlooking the Arabian Sea. Due to its scenic beauty, it is the best place for photography. Enjoy leisure time with family and friends at this amazing fort. Reis Magos Fort: The Reis Magos Fort is located on the northern region of Goa. It was recently refurbished and is very well maintained. You will have a beautiful view of the Mandovi river and Panaji city from this fort. The art exhibition of Goa’s famous artist-cartoonist will leave you in awe. Private functions can be held in this fort. Chapora Fort: This great fort is situated in the Northern region of Goa and overlooks the Chapora river. The Chapora Fort is built in the year of 1684 by the king of Bijapur and Adil Shah. The present fort was built in 1717 and commands views in all directions, north across the Chapora river to Pernem, south over Vagator beach and also far out to the Arabian Sea in the West. Hopefully, this list of the best attractions in Goa features in your itinerary while travelling to Goa. If you are looking to explore more places in Goa, kindly refer the Blog. What are the Winter sports activities you can enjoy at Goa?